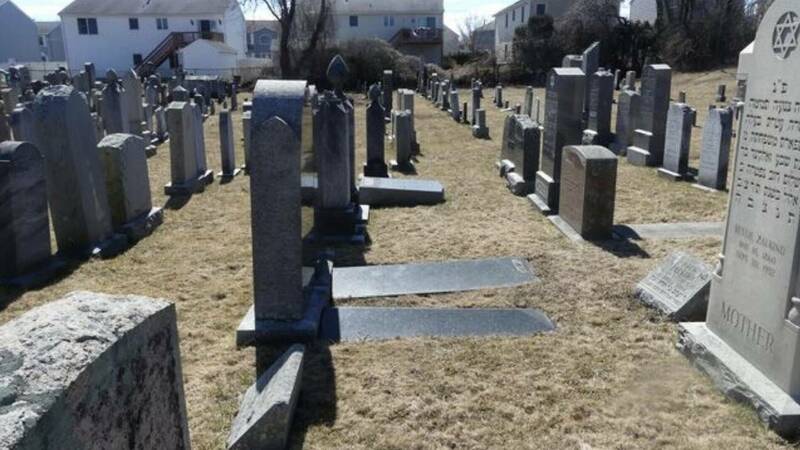 Fifty-nine gravesites at a Jewish cemetery in Fall River, Massachusetts, were desecrated with swastikas and anti-Semitic phrases, police said. (CNN) - Nearly five dozen gravesites at a Jewish cemetery in Massachusetts were vandalized with anti-Semitic phrases and images, police said. Fifty-nine gravestones at the Hebrew Cemetery were marked with swastikas and derogatory phrases in black magic marker, the Fall River Police Department said. Some phrases praised Hitler. In addition, some gravestones were pushed over, police said. Police are investigating the vandalism as a hate crime with the FBI's assistance. A maintenance worker spotted the damage on March 17. Police believe it occurred the day before or early that morning. Officials said they do not have any solid suspects as of Thursday morning. The Anti-Defamation League of New England has offered a $1,500 reward for information on the incident. The regional director, Robert Trestan, condemned the vandalism in a statement. "The desecration of The Hebrew Cemetery of Fall River is an inexcusable act of antisemitic hatred in the place where we honor and remember the lives of our community members," Trestan said. Stephen Silverman, the president of Temple Beth El synagogue in Fall River, said the Jewish community is remaining resilient. "The ugly head of anti-Semitism has raised its head again," Silverman said. "Being Jews, we will survive and persevere, and we'll get this all squared away." He said the community has been "greatly upset" and "everybody wants to help out." The cemetery caretaker plans to restore the affected gravestones to their original state, Silverman said. He said the incident is part of a growing problem of hate group activity in America. "America has got to be aware of all the situations going on -- it's getting worse and worse," Silverman said. "I hope for the safety of everyone in this country we get to the bottom of these hate groups and start preaching and educating people at schools and home."